I’ll be taking a break from weddings until September. Apologies in advance for delayed email replies until then. Create and Celebrate your special day - your way! Personalised Ceremonies - Weddings, Renewing Your Vows, Baby Naming. I could not imagine a better celebrant. As a first time weddingers Emilie stepped us through the entire marital process with ease and professionalism. Emilie ended up being the gel that brought the whole wedding together and was pivotal in making the whole ceremony absolutely fantastic. Her suggestions after our first meeting were fantastic and we really connected. I could not imagine a better celebrant. We cannot speak highly enough of Emilie! She is organised, down-to-earth and so genuinely caring. She was there to help us every step of the way to create the perfect ceremony for our little wedding. Thank you for all of your advice, for helping calm our nerves and for creating the most beautiful wedding ceremony. Paul & I would definitely recommend you to everyone! We had a wonderful experience with Emilie as the Celebrant for our wedding in March 2017. She was so thoughtful and considerate of our personal needs and she really took the time to get to know us as a couple so that the ceremony was a true representation of us and our relationship. Emilie was organised and clear of all the legal requirements as well as being creative to make the ceremony exactly what we wanted it to be. We would be very happy to recommend Emilie! Emilie was absolutely the right choice to have as our MC at our wedding. She was happy to listen to our ideas and incorporated everything we asked for as well as providing us with a template as we weren't really sure were to start. Emilie worked really well with our DJ and together they kept our guests engaged and entertained throughout the evening. This is now! Love is Love. After years of petitioning, marching, and dealing with the toxic plebesite – on Friday 8th December 2017 the laws were changed in favour of marriage equality. A month ago today, Rob and Jules were married on the Penthouse Balcony of the Cullen Hotel. My name is Emilie Rosenberg and I am someone who simply loves love. After attending an intimate wedding celebration for two friends I realised that this was something I wanted to do – the magical act of making a couple ‘married’. Weddings are wonderful opportunities to celebrate love in all it’s forms, every couple is different and so every wedding should be different too. The fantastic thing about a civil ceremony is that it is a celebration of the couple – their personalities, their interests, and everything that is important to them. They can include readings, performances, and traditional elements that are important to them personally and as a couple. Civil ceremonies celebrate inclusivity, personality, and love. I look forward to crafting a personalised ceremony to help you celebrate your special day, your way. 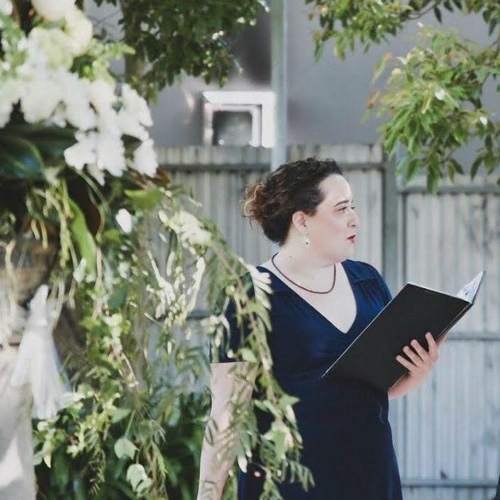 Emilie Rosenberg Marriage Celebrant performing Weddings, Vow Renewals, Baby Naming Ceremonies and offering MC Services in Melbourne, Victoria and Australia. Your wedding should be about you, and that's what I'm here for.